Paradise-Moorea | 3 beds Beachfront Villa with a plunge pool. Beachfront beautiful wooden 3 bedrooms house each one with A/C with deep water in front. Overlooking the peaceful lagoon of Papetoai, this villa provides a refuge for easy living along with Balinese design. The decorations are inspired by the Four Seasons Hotel in Bali and Indonesian culture. A hardwood deck runs the length of the house. There is also an outdoor dining table, lounge chairs for sunbathing, and a plunge pool for cooling off on hot days. The beach is located directly in front of the villa, where the calm waters are perfect for snorkeling or swimming to start the morning off right. The living room and master bedroom open directly onto the deck and magnificent view, but can also be closed with large sliding glass doors. The villa is a paradise for honeymooner. 2 Open Living Rooms onto the deck beachfront. Master bedroom ensuite with queen size bed, shower room, dressing room, A/C and Sea View. 1 Double bedroom with mountain view and a terrace and A/C. 1 Twin bedroom with A/C, Mountain view and large private terrace, possibility of 2 extra single mattress for 2 kids. Terrace on the Seaside partially covered. Direct access to the beach from the terrace. Fridge, freezer, oven, microwave, stove, water cooler, dishwasher. A bath towel & a towel per person. Parking in the garden or garage. Fresh fruit basket -OUT FOR 65 XPF. All the bedrooms of the house have the air-conditioning. As you know, the consumption of air conditioners is very high. As you don’t know, electricity in French Polynesia is very expensive (one of the most expensive in the world…). When you arrive, we make a meter reading. Same when you leave. At the end of your stay, if the total electricity consumption exceeds the daily rate, you’ll pay for the difference. What a gorgeous home in a beautiful location! We really enjoyed our stay here! Eric the manager was just lovely. He helped us with information and advice from before we left our home, through our whole trip to Moorea. He was hands on immediately as we needed him. Such a kind man!! As for the house, I loved the folding glass door-wall that completely opened up the house. Now I want them at my home. Ahh!! Some day. And the master shower that opens to the outside, another favorite. I also loved the couple nights it rained and the sound of the water trickling through the metal trays in the center indoor patio of the house was so peaceful. I loved relaxing in there. These were my favorite bits of the house, but the beautiful bedrooms with opening glass walls, and the view from the master bedroom were spectacular. Kitchen is also lovely and fully stocked with any cooking equipment we needed. What a lovely house! We kayaked from the house spotting sting rays and beautiful fish, location made it easily accessible to market and restaurants. Recommend chocolate croissants from the local market. So good!! We really enjoyed our time in your home!! This villa was my best experience ever on 45 years of vacations. The price is ridiculous for the quality you get, the pictures do not give justice to this property. The view is just amazing, we've got our own private beach, and you can really swim in front, it is not like most of the beach where you get 1 or 2 feet deep in Moorea. An old man explain me that they remove some of the reef in front to build the main road of the island. Alex, Chantal and Jack have been really nice along the booking process (Chantal and Jack are the owners, but his son is in charge of the reservation). I'll advise you to visit their blog (paradise-moorea), the did some nice videos to explain the history of the villa or what to do. You can also get a discount... Eric the house's manager was really helpful, he his living close by, but you'll never need him as everything was set perfectly before we arrived. We will definitely come back very soon. Please do not book it, I want all the weeks for me lol. I had the chance to stay at the Villa Blue Lagoon for 2 weeks, the only think I could say is that I was in paradise! The villa is beautiful, you really feel like home. The master room is very comfortable, you wake up with an amazing view. The whole house is decorated with taste, it is very nice balinese style and clean. The deck is a great asset and also the large jacuzzi. In the evenings you can enjoy one of the most beautiful sunset view on the island. The villa is located in a small community, the neighbours are local people, I enjoyed the opportunity to interact with them and it was good to avoid the crowded tourism zone. It is highly recommended to rent a car so that it gives you the freedom to discover the island. You will find some convenience shops about 5 minutes drive away, a big supermarket is located 20 minutes drive away. You have tons of activities to experience- things you should not miss: A lunch at the Snack Mahana, A pizza at "Chez Daniel" (to take away and enjoy on the villa's deck), diving with Henry from the scubapiti diving school (Les Tipaniers), a sky dive with Tahiti Parachutisme etc... 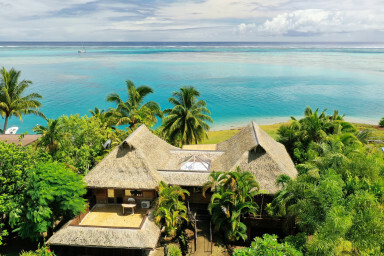 If you have the opportunity to visit Moorea and you don't want to stay in a hotel don't miss out the Villa Blue Lagoon! Lovely location and lovely house. However, One of my main reasons for booking this villa was its advert of a hot tub. Well it wasn’t hot and it had minimal movement of water. This is not “a hot tub” at all. Très jolie maison de style balinais en bord de mer ; très bien équipée et propre. Nous avons pleinement profité des balades en kayak et en paddle et admiré les raies au bord de l'eau. Le plus, le Jacuzzi sur la terrasse !!! Eric, qui s'occupe de l'intendance de cette propriété, est très gentil et serviable. Une adresse que je vous recommande ! We spent a week at Chantal's place (family of four) and were most impressed with with location and privacy (on a quiet street with a large semi-private beach), amenities (kayaks, very well-stocked kitchen, very comfortable beds/bedding), Eric (met us at check-in, stopped by with fresh coconut, was available down the street and eager to answer questions), and the space/view (three large bedrooms with plenty of indoor/outdoor common space and an entire wall of ocean-side windows and doors). Our favorite hidden gem restaurant: Lilikoi Garden Cafe. Our favorite activities: diving with Top Dive and Xavier (at the Intercontinental), lunch and snorkeling at Coco Beach, and the views from Belvedere and nearby Magic Mountain. The location is right in between everything on the north shore. Loved our stay! Thank you for the impressive hospitality Eric!